I love Italian food. Sure, it can be pasta heavy, but it’s also often heavy on the fresh vegetables and the herbs, creating some delicious tastes, amazing aromas, and surprisingly healthy dishes. One dish we often make is what we call, in our own slang, “pesto pasta.” Basically, we just make up a batch of pesto, which is really easy, then we cook up whatever pasta we have on hand. We mix the two together, serve them with a side vegetable, and enjoy. I can bring this meal from idea to the table in fifteen minutes, and the cost isn’t very high, either. Obviously, you’ll need some sort of pasta. Pesto clings to almost any type of pasta, so I usually just use whatever we have on hand. All you need is 1/2 cup extra virgin olive oil, about 1 cup of basil leaves (or 1/3 cup dried basil), 1/2 teaspoon salt, a dash of black pepper, a teaspoon of minced garlic, and two tablespoons of either walnuts or pine nuts (the picture above uses pine nuts). You’ll also want to add 1/4 cup Parmesan cheese if you wish, but it’s pretty tasty without it. The ingredients add up to a couple dollars, but they make for a spectacular dish. Making the pesto is easy and it can be done a day in advance. All you have to do is tear up the basil leaves into small bits (if you’re using fresh basil, that is) and add it to a blender or food processor. 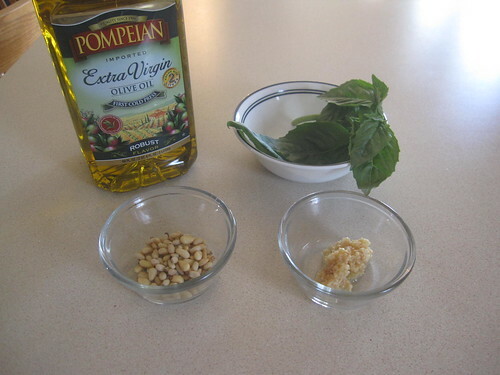 Add all of the other ingredients except for the olive oil, then add a small portion of the oil. Blend for a few seconds, then add a bit more oil. Repeat until all the oil is added, then pour/scrape the pesto out of the blender. You’re done. That’s it. Put the pesto in a small container and stick it in the refrigerator. 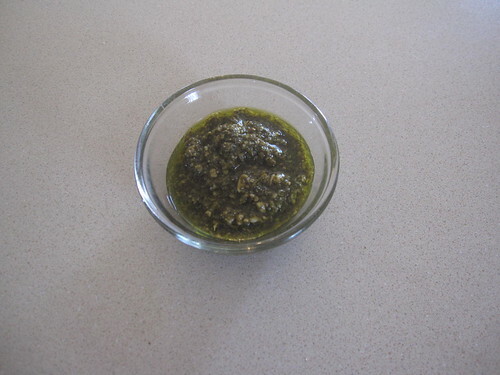 I like the pesto slightly warm, so I pull it out of the refrigerator and heat it gently before the meal. At the same time, I cook the pasta according to the appropriate directions, then drain the pasta. 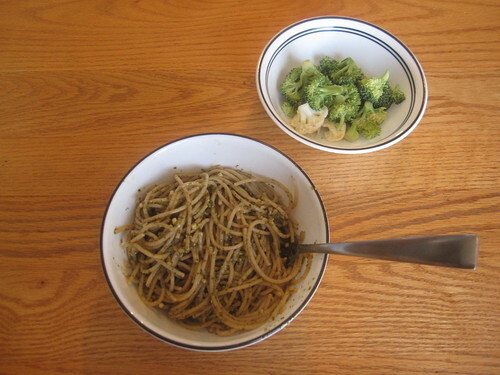 I then mix the pasta and pesto together until the pasta is coated, then serve it with a side of vegetables. In this case, the side vegetable was some leftover broccoli and cauliflower from an earlier meal. The pesto itself is incredibly flexible, with thousands of variations. Pistou consists of just olive oil, basil, and garlic, and is quite delicious. Pesto alla siciliana adds one cup of diced tomatoes, replaces the nuts with almonds, and uses only 1/4 cup basil leaves (or 1/8 cup dried basil). Other ingredients to try include grilled bell peppers, black olives, lemon peel, coriander, mushrooms, and miso paste. Of course, you can also prepare this with a meat in addition to the sauce. Chicken is particularly good with pasta and pesto sauce.